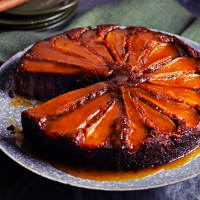 This treacly ginger cake is a little bit like parkin, studded with tender pears and drenched in a syrupy glaze. 1. Preheat the oven to 180 ̊C, gas mark 4; grease a deep 23cm cake tin. Arrange the pears in the base of the tin. 2. Gently heat the butter, cream, sugar, syrup and treacle in a small saucepan until the butter has melted. Stir to combine, tip into a mixing bowl and leave to cool for 5 minutes. 3. Whisk in the eggs one at a time, then mix in the flours, baking powder, bicarbonate of soda, spices and a pinch of salt until just combined. Tip into the tin over the pears and bake for 45-50 minutes. 4. Set the tin on a wire rack to cool for 15 minutes. Meanwhile, make the glaze. Bring all the ingredients to the boil, then simmer for 10 minutes, until syrupy. 5. Remove the cake from the tin and turn upside down so the pears are on top. Spoon over the glaze, then leave to cool.